Vampire Killer is a computer game created by Konami in 1986. It is the second Castlevania game in the series, one of the games for the MSX2 computer, and it's an adaption of the original Castlevania game. 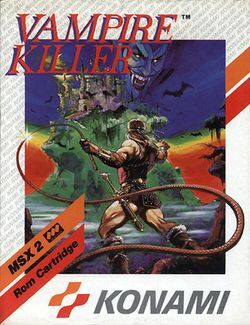 Vampire Killer is seen as unique in the early Castlevania series for containing several features that weren't seen in other games that were intended to be remakes of the original game. For example, to progress in the game, it is necessary to acquire "skeleton keys" hidden in the several rooms within the game's castle, in order to open doors to other rooms. Other keys also have to be found in order to open treasure chests containing useful items, such as shields for protection and speed boots. Merchants can be found along the way (often by breaking open walls with the whip) who sell items to the player. While containing considerably different gameplay than the original Castlevania, both games share most of the same background settings, enemies and music. The unique gameplay features from Vampire Killer were reintroduced to the Castlevania series with Castlevania II: Simon's Quest in 1988 and Castlevania: Symphony of the Night in 1997. As with many other MSX titles such as Metal Gear and Contra, the action takes place one screen at a time in a fashion similar to the original The Legend of Zelda for the NES. The game's premise is the same seen on many Castlevania games. Simon Belmont ventures inside Castlevania to defeat Count Dracula and restore peace in the land of Transylvania. He fights his way through hordes of monsters, wielding only a whip. This page was last edited on 13 October 2018, at 18:31. This page has been accessed 13,091 times.